Nowadays, it seems that new brands have difficulty finding traction with consumers. Our society has become so infatuated with logos, familiar names, and a storied history that it can be hard for a newcomer to break through and become part of the modern canon. This is especially true of board games. List off the names of some of the most popular board game titles and you’ll be rattling off 80+ year old franchises: Monopoly, Scrabble, Risk, Clue… with one exception. Apples to Apples is relatively young compared to the venerable Parker Brothers mainstays and has become a perennial top seller over the last decade. For those who haven’t played, the concept of Apples to Apples is simple: one player pulls out a card with a descriptive word on it, and every other player places down a card from their deck with a noun on it. The player who put down the original descriptive card then chooses which of his competitors gave the best response. Whoever wins gets a point. Repeat and switch judges every round until you have a victor. When I heard that Apples to Apples was being turned into an Xbox 360 Arcade title, I wondered how developer ImaginEngine and Publisher THQ would manage to handle the adaptation. Playing in a room full of hooting friends and family members is all part of the charm of the game. Separating the participants seemed like an easy way to dull what makes Apples to Apples so very special: the interaction between the participants. Even more concerning was how the developers could possibly turn this classic party game into a single player experience. In a nice surprise, ImaginEngine was able to make a more than adequate solo game. Players are presented with a crossword and have to find one of three words that best matches the other “players” personality. For instance, if you have the sporty football player, you should try and find an athletic answer. This does a good job of mimicking the multiplayer experience while adding a unique game play element. Most players won’t get more than one or two hours of this mode, though, so don’t go in expecting a fully realized offline game. Graphically, Apples to Apples meet expectations. Aping the distinct style of the board games adorable fruit critters, gamers can choose their favorite apple avatars to represent themselves when playing online. Because of the large amount of relatively small text onscreen, lower resolution TV screens will actually hamper this low-fi game more than usual. When you have to quickly make out the words on four small cards, blurry letters can be a major problem. Most players with a decently sized HD TV shouldn’t have any issues, however. The real meat of Apples to Apples is the multiplayer. Online play is quick and easy, letting players get right into matches with as little fuss as possible. It is possible for players to use microphones if they want to get chatty with their online opponents, but in my experience it was exceptionally rare. Which is a shame, because a lot of the magic that is Apples to Apples is lost without a generous back and forth debate about the unique merits of each player’s choices. 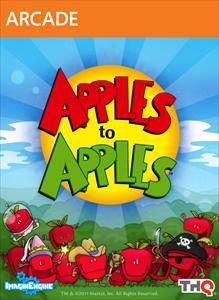 Anyone looking for the authentic Apples to Apples experience should focus on local multiplayer. Grab up to three friends, sit down, and play all together in one room. A few concessions have to be made to facilitate using one screen, but it is shockingly close to the real thing. Some might miss having custom cards, but if you have enough controllers already, this is a great way to get this world famous board game instantly for less than it would cost to purchase a physical copy. Apples to Apples commendably offers more than expected for a title based off of a card game. For those who are able, playing local multiplayer is refreshingly similar to the real experience. Unfortunately, the average online match is simply unable to provide the give and take and interaction with other players that makes the Apples to Apples experience so special. However, if you’re looking to relive college game night with your buddies virtually, this XBLA might be the perfect fix.